Raphael Ahren wrote a nice article on the project in this week’s Anglo File Section of Haaretz that appeared both online and in-print (pdf). Please read the article at Haaretz (support Raphael’s page views! ), and return here to comment — below the reprint. Aharon Varady always dreamed of putting together his own prayer book. Realizing that many people – including himself – often see prayer as a dull and robotic exercise in the fulfillment of a religious duty, he thought for years about ways to enable people to create their own prayer book, or siddur, in order to make the most of their experience. 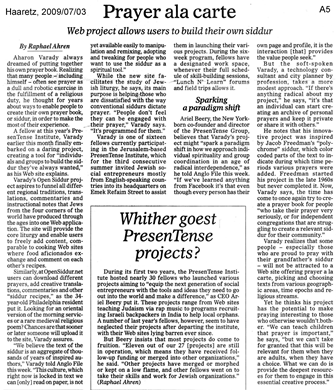 A fellow at this year’s PresenTense Institute, Varady earlier this month finally embarked on a daring project, creating a tool for “individuals and groups to build the siddur they’ve always wanted,” as his Web site explains. Varady’s Open Siddur project aspires to funnel all different regional traditions, translations, commentaries and instructional notes that Jews from the four corners of the world have produced through the ages into one Web application. The site will provide the core liturgy and enable users to freely add content, comparable to cooking Web sites where food aficionados exchange and comment on each other’s recipes. Similarly, at OpenSiddur.net users can download different prayers, add creative translations, commentaries and other “siddur recipes,” as the 34-year-old Philadelphia resident put it. 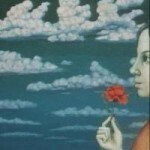 Looking for an oriental version of the morning services or a rare medieval religious poem? Chances are that sooner or later someone will upload it to the site, Varady assures. Varady is one of sixteen fellows currently participating in the Jerusalem-based PresenTense Institute, which for the third consecutive summer invited Jewish social entrepreneurs mostly from English-speaking countries into its headquarters on Emek Refaim Street to assist them in launching their various projects. During the six-week program, fellows have a designated work space, whenever their full schedule of skill-building sessions, “Lunch N’ Learn” forums and field trips allows it. Varady realizes that some people – especially those who are proud to pray with their grandfather’s siddur – will not be attracted to a Web site offering prayer a la carte, picking and choosing texts from various geographic areas, time epochs and religious streams. ““Prayer a la Carte” (Haaretz 2009)” is shared by the Hierophant with a Creative Commons Attribution-ShareAlike 4.0 International copyleft license.